American Crafts Bootiful Night Party Fun! This banner was the most successful, and possibly the easiest piece to make! By using the metallic Halloween collection side web die-cuts as a base, I added punched circles of patterned paper, die cuts and stickers to the web, then threaded each web through baker's twine to hang. 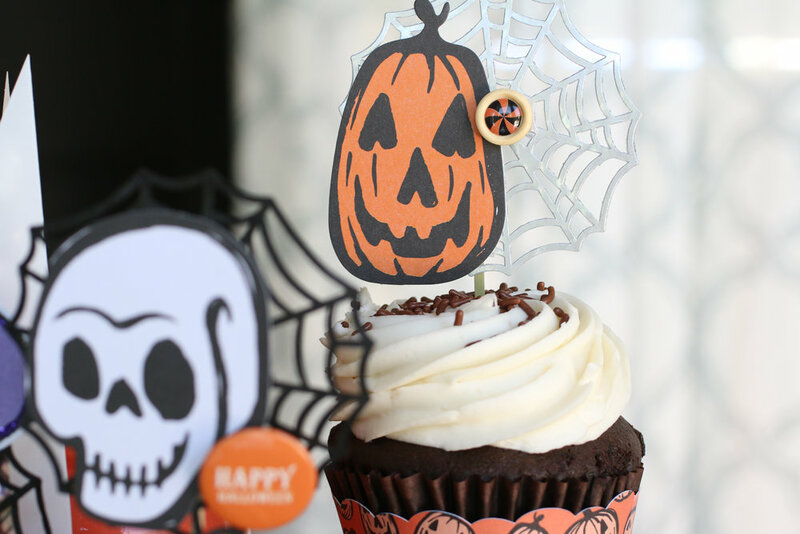 I used the same spider web die-cuts for the base of these cupcake toppers as well, adding the amazing die-cuts, flair and buttons to top them off before backing them with a bamboo skewer to stick into my cupcakes. These were so simple to make, and when added to a cupcake wrapped with the Bootiful Night 6" x 6" patterned paper, they are dressed and ready to be eaten by spooky little monsters! To a vellum treat bag, I added this fun tag, created with the 6" x 6" patterned paper, and layered with the ephemera die-cuts, spider web, and flair stickers. I also sewed the tag with my sewing machine and added baker's twine for extra texture before adhering it to my treat bag and filling with our favorite caramel popcorn mix! This little celebration was so easy and quick to put together with the coordinating products in the Bootiful Night collection! There is still plenty of time to add those handmade touches to your Halloween celebration, so be sure to pick up these "bootiful" goodies today! Looking for a must-have snack for your Halloween celebration? Fill up a cauldron of our favorite sweet mix and watch it disappear! (adapted from this recipe by Taste of Home) Yield: about 5-1/2 quarts. In a large greased roasting pan, combine the popcorn, cereal and peanuts. In a large saucepan, combine the brown sugar, corn syrup, honey and butter; bring to a rolling boil. Boil for 6 minutes, stirring occasionally. Remove from the heat; quickly stir in vanilla and baking soda until mixture is light and foamy. Immediately pour over popcorn mixture; toss to coat. Bake, uncovered, at 250° for 1 hour, stirring every 15 minutes. Stir in candy pumpkins. Cool completely & enjoy! In case you missed it, earlier this week I also shared this fun new layout on the American Crafts blog! Be sure to check out the full blog post to find out how I created it! You can find the Bootiful Night collection here at Scrapbook.com, with the exception of the die-cut leaves, spider web die-cuts. and wooden buttons, which I found on Amazon. Thanks so much for stopping by, and happy crafting your spooky Halloween celebrations!